Border collie named Stella competes in the masters agility preliminary rounds during the Westminster Kennel Club Dog Show, Saturday, Feb. 9, 2019, in New York. NEW YORK (AP) — Zurri isn't the typical picture of an elite agility dog. As a Bernese mountain dog, she comes from a breed historically known more for pulling carts than maneuvering through an obstacle course. So just stepping into the ring — heck, even stepping out of the car — at the Westminster Kennel Club agility contest for the first time Saturday felt like success to owner Cheryl Brickach. "A Berner doing agility is sort of like bringing a Clydesdale to the Kentucky Derby," laughed Brickach, "but that doesn't matter." What does, she says, is showing that the big, sturdy breed can be athletic and competitive in the popular sport. And seeing that Zurri's tail is always wagging as she runs the course. "And it's kind of a pinnacle of dogdom to be at Westminster," added Brickach, of Bristol, Rhode Island. The agility contest, which starts the club's storied annual dog show, featured 330 accomplished dogs as big as 98-pound Zurri and as small as a Chihuahua. Finals were set for Saturday night. 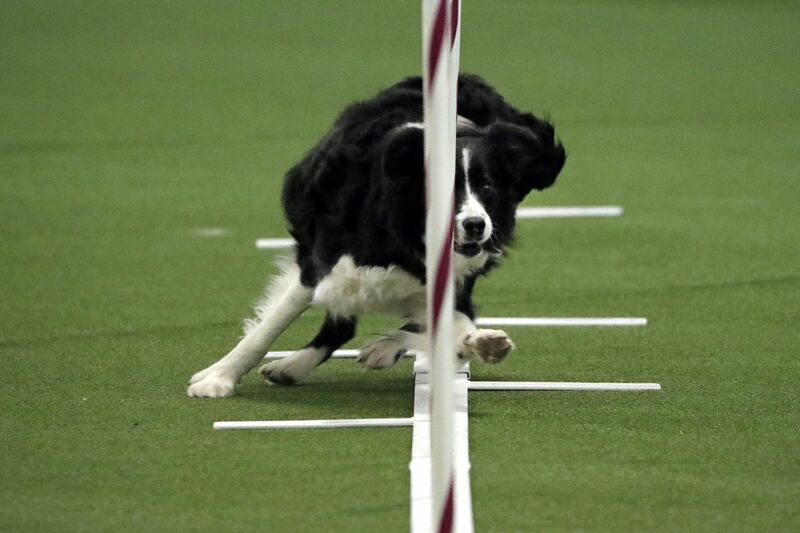 In agility, dogs navigate jumps, ramps, tunnels and other objects on a route packed with tricky turns. Handlers, who are often the animals' owners, guide them with voice and hand signals. Scoring is based on a dog's speed and accuracy. Border collies and Australian shepherds have been the agility power breeds so far at Westminster, winning every time since the sport was added to the annual show in 2014. Fifty border collies and 16 Aussies were entered Saturday. Traditionally bred to herd livestock, "they're used to turning on a dime" and can translate that skill to the agility course, Tom Gooding of Schenectady, New York, explained while waiting to compete with his Aussie, Lili Ann. Although dominated by purebreds, the contest is also open to mixed-breed dogs, and the top scorer gets a special prize. Some 27 contestants were in that mix this year, including Buster, a shih tzu/silky terrier blend that was brimming over with energy as a puppy. Owner Jackie Soccodato tried agility as an outlet for him. Six years later, she feels the sport works for both of them. "It gives me a goal. It gives him a goal," said Soccodato, of New Rochelle, New York. And it's "a great way to bond with your dog." Like any athletes, the dogs have different strengths. Plenty, a golden retriever, takes to the weave poles, or zigzagging through a line of posts. Kie, a miniature schnauzer, doesn't. But he digs the dog walk, a ramp-and-plank assembly. Owner Jim Murphy of Nashville thinks that's because the poles require a certain amount of concentration, while Kie "really likes to go all-out." Darby, a Boston terrier, is into the A-frame, a steep, peaked ramp. Her least favorite thing? "She doesn't like staying at the start line," chuckles owner Nicole Davilli of Virginia Beach, Virginia.